Desk lamps all now available to buy at Harvest Moon to light up your desk at home or in the office. In the desk table lamps range below we've got contemporary metal desk lamps including a wood / nickel spot light desk lamp, black / nickel study lamps, chrome, nickel, brass and black brass angled library desk lamps, copper desk lamps, a steel / leather desk lamp, a twin column desk lamp, classic Stag study / desk lamps and lots more. 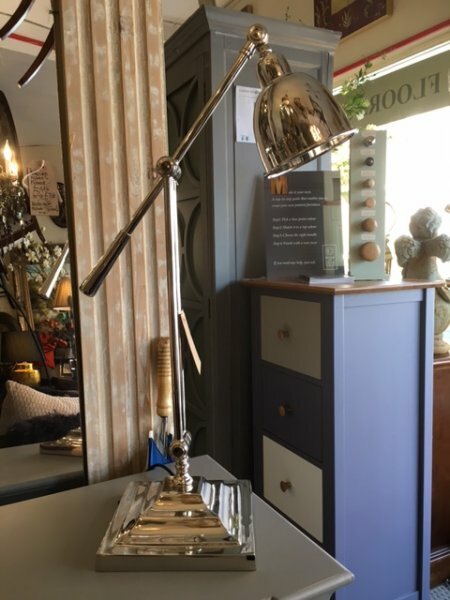 The image above shows a slim "nickel" angled desk lamp, one of our favourites from our desk lamps range, on display in our showrooms. FREE 7-14 days delivery to UK mainland addresses on all desk lamp and other lighting orders at Harvest Moon.